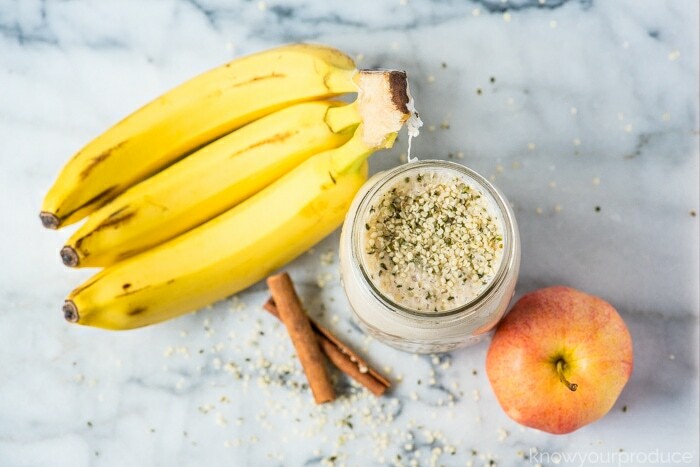 Our Apple Banana Smoothie is the perfect smoothie for fall. 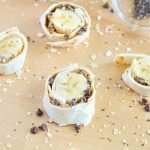 This recipe is gluten-free, dairy-free, and vegan too! 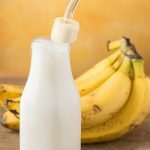 why make an Apple Banana Smoothie? This drink is refreshing and a great way to use up apples from apple picking. We use smaller apples, but if you have large apples you can just use half. It gives you all the fall feels! 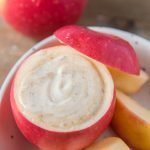 Our family enjoys this recipe around the fall when apples are in season locally. It’s a great treat and so easy to make. We don’t use fruit juice in this recipe, it’s unnecessary added sugar. If you wanted it sweeter add in a carrot or some beet, that would give you a fruit and vegetable! This recipe is super simple to make. Just place all of the ingredients into the blender, add your favorite add-ins, then blend and enjoy. For a really smoothe smoothie, we like to use a high-speed blender. When you’re blending ingredients that are solid like apples, you really want the blender to liquefy the ingredients. 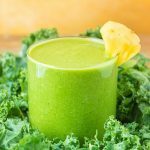 If you use a slow speed blender you may feel like your smoothie tastes like gritty, not the ideal texture. A high speed blender is a great investment and they will last you many years! Most even have 5+ year warranties so if there’s an issue with it you can have it fixed easily or even replaced. 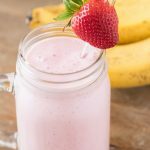 See our how to make a smoothie to show how to fill the blender with ingredients. 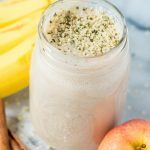 Why hemp seeds in smoothies? These superfood seeds are an excellent source of plant protein! Hemp seeds are full of health benefits. They’re a great source of fatty acids like ALA (alpha-linolenic acid) and omega-3 fatty acids. Vitamins like magnesium, potassium, phosphorous, folate, vitamin E, and vitamin B-6. It gives this recipe a nice amount of protein when added without using a protein powder. 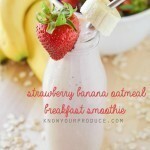 You can blend some into the smoothie and then sprinkle even more on top. They even make a hemp protein powder that you could also use. Some of these ingredients may change the flavor, so keep that in mind when adding. It’s a delicious smoothie without them, but you can add whatever think will compliment it. We don’t suggest adding in something like mango or pineapple as that will completely change the flavor, but something like carrots, spinach, frozen cauliflower, that works! The cauliflower will actually help thicken the smoothie up a bit. We suggest steaming the cauliflower and then placing it into the freezer for later use like this. You could strain this through a cheesecloth, but we really want you to have the fiber from this recipe, so we don’t recommend doing that unless you can’t tolerate the fiber. If you have apples that have a mealy texture, like a Mcintosh apple, we suggest not using that in this smoothie. It will give it that gritty texture and not the greatest flavor. We like using Fuji, Granny Smith, or even Gala apples for the best results. Want to enjoy this as a dessert? Add in some greek yogurt or dare I even say ice cream?? Honestly, it’s delicious as is, and if anything I like using a frozen banana instead of fresh if I want it a little thicker. 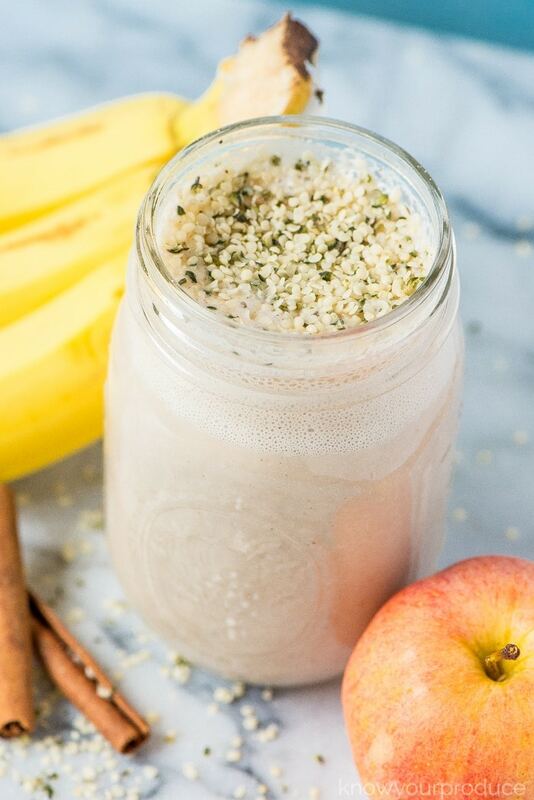 This is an almond milk smoothie, but if you don’t like almond milk you could use soy milk, coconut milk, or even oat milk. 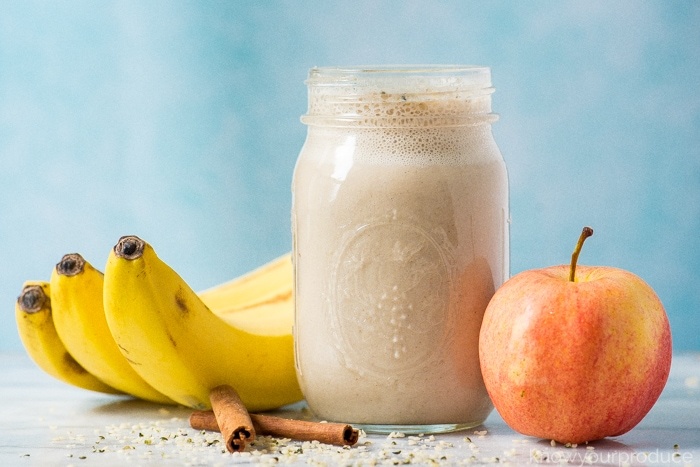 Our Apple Banana Smoothie is the perfect smoothie for fall. 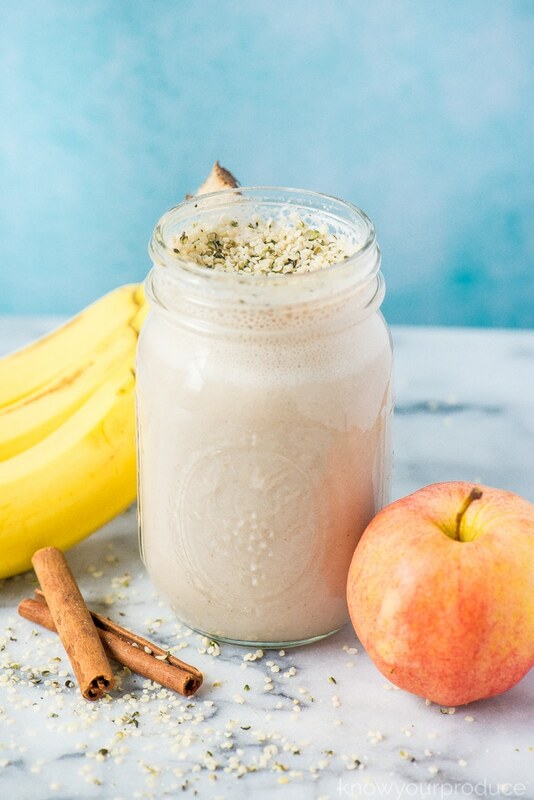 This is an almond milk smoothie which is gluten-free, dairy-free, and vegan too! Place all of the ingredients in the blender by the order listed, also add in any optional add-ins. 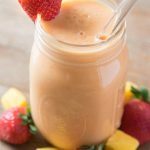 Blend the smoothie until all of the ingredients are liquefied. 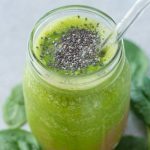 Top with more hemp seeds if desired and enjoy.